Processing boards podborany. In the products of silk fabrics, the inner sections of podborov overcast. If podborta have the gasket, eyelet perform with her. In the products of legkopolirujushchiesja tissues of the internal sections of podborov overcast, and then zastrugivajut seam itagiba the open cut (Fig. 501 a) or treated without serging seam bodybu closed cut (Fig. 501 b). The inner sections of podborov for products made of cotton fabrics, in addition to the above, treated with bodybu seam open cut.Podbot placed on the shelf face on the front, stack the slices and metiaut, landing from podborta in the corner side and on the lapel, with side shelves - at the level of the clasp, and then grind the side and the ledge from the shelves. The seam allowance on grinding bead scribbled on podbot at the level of the fasteners, on Board - level lapel in the products of knitted, crimplene paintings, wool and crisp silk fabrics, and all fabrics legkopolirujushchiesja according to the model. Line have a distance of 0.2-0.5 cm from the seam stitching around the side. 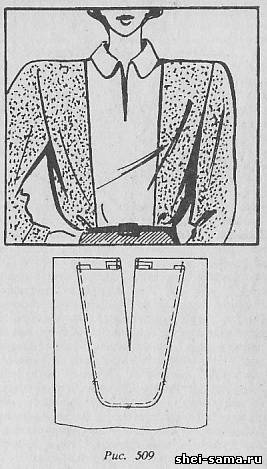 Ledges to grind the sides of the notch or on to the shoulder seams depending on the method of Tachibana collar (Fig. 502). 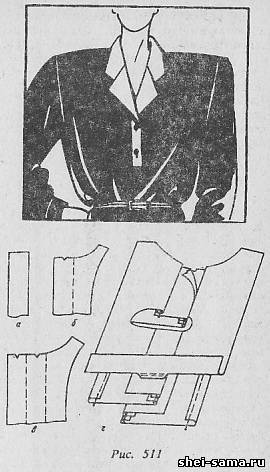 Products in the clasp to the bottom of the lower cotton fabrics, cut podborta added to the allowance for bending the bottom, right sides inside, and sew smatyvay seam width 0.7-1 cm (Fig. 503). Straighten the seam, directing it towards allowance for bending the bottom. Then the allowance for bending the bottom bend on the front side of the product according to nadechka defining the line of bending of the bottom of padbolt folding with a shelf, right sides inside, smatyvay Board and the ledge grind. The seams of the top and bottom corners are cut, leaving a seam allowance of 0.2-0.3 see the Board turn on the front side, spawn, straightening, piping on the lapels of podborov, on the sides - shelves and produisait. The inner edge of podborov attached to the product depending on the model: in the articles of cotton and linen fabrics - through line; in products made from other fabrics by hand every 15-20 see the products buttoned up to the top serged or obraznymi loops for buttons, the inner edges of podborov not attached. In children's products with a collar, where the inner edge of podborov do not have seam allowance at the shoulder cut, and reach to the highest point of the neck shelves or recede from it by 1.5-2 cm to the middle of the front (Fig. 504), the inner edges of podborov in the upper part under the collar attached to the machine, positioning the stitching on 1.5-2 cm down from the neck. In this case, the inner edge of podborov level lapel not attached. In the products of clasp to bottom of knitted fabrics, woolen or silk fabrics, the bottom of the inner edges of podborov primetyvajut and pritachivajut to the allowance for bending the bottom on the machine (Fig. 505), having a line at a distance of 0.2-0.3 cm from the edge of podborta. The top of podborov applied to the allowances of the shoulder seams of the product with the ACC or cut without bending, if the slice is pre-serged, and pritachivajut to them at a distance of 0.2-0.3 cm from the bent edge or 0.3-0.4 cm from the serged slice (Fig. 506). Processing boards podborany, clinofibrate with shelves. In this case, the shelf needs to be applied to the line of mid front and edge of the Board. The inner sections of podborov, televissionnykh with shelves, treated in the same way as slices of podborov, separately cut. After treatment obrechennyh loops (if provided in model) podborta bend on the front side along the line of the edge of the Board or nadechka, smatyvay ledges of the fold to nasechek and bottom edges of the boards in products from the clasp to the bottom, then grind.The seams, in corners cut, turn the side to the front side, straighten seams and spawn, zametyvayut at the edge of a Board and priorivet. In the presence of obrechennyh hinges on the right shelf, the ends of podborta under the loops cut in the ends of the angles, slices of podborta tuck inside and sew hidden stitches. If the products zelenolistnye podborany there is a pad, its pre-namachivajut and scribbled on podbot, with the cut strips on the line side. Line have a distance of 0.2 cm from the side of the cut strip. Treatment of the sides of the straps, sewed to the cloth on the front side. On the front of the shelves and on the underside of the strap plan a line of bending the bottom. The inner edge of the strap in the products of wool and silk fabrics bend towards the inside of 0.5-0.7 cm or more, depending on the width of the finishing stitches. Zametyvayut and iron. The bar is applied the lower end on the front side of the shelf face down (Fig. 507 a), combining the planned bottom line bending, primetyvajut and pritachivajut on the planned line.The allowance for bending the bottom shelves also bend towards the inside on the planned line, the slice bends inward at 0.5-0.7 cm and zastrugivajut on the section of the strap, for products made of cotton cloth around the bottom. The bar bent on the underside of the shelf face down, fold, equating edging edge, having seam primaqiune on the bottom on the bend, and grind the Board and the ledge side to the notch defining end of the seam primaqiune collar. Seam width 0.5-0.7 cm (Fig. 507 b, C).The seam allowance in the corners cut, turn the bar on the front side, straighten the seam, spawn, forming the edge of the strap towards the back shelves, and priorivet. The inner edge of the shelves namachivajut and scribbled. Distance from line to edge connector depends on the model. Bar ready priorivet. The Board left the shelves can be processed in the same way as the right, or podborta as described above. Treatment closure one facing. A clasp with a loop of vetochnogo or braided cord, make this files most often on the back of children's dresses or sleeves with cuffs. To the upper side of the chain first attach the prepared loop. Treatment incision performed one facing. The incision is laid out in one straight line, facing the impose face on the reverse side of the product, primetyvajut and grind the slices from the product. Seam width 0.5-0.7 cm (Fig. 508). The seam allowance from the main part at the end of the section negated.Obtachku bend on the front side of the product, the slicer bends to the inside by 0.5 cm and scribbled his, closing the seam primaqiune at a distance of 0.1 cm from the bent edge. The stitching from the inside should take place around the seam of primaqiune piping to the primary (Fig. 508 b). The lower end closure fixed line across the width of the piping, positioning it at an angle to the edge of the clasp (Fig. 508). During the processing of the neck with a clasp obrazkami process after treatment of the neck. The facing to the zipper is applied face down on the underside of the product so that the upper section of piping was above the processed region of the neck 0.7-1 cm (Fig. 508 g). After primaqiune the facing is folded along the middle face inward and grind the upper ends (Fig. 508 d), bending the free edge of the piping in the direction of inside 0.5-0.7 cm the fold should overlap the seam primaqiune piping. Joint width 0,7 cm Seams, in corners cut, turn obtachku on the front side, corners and joints straighten and spawn, shear piping bends and scribbled inside, closing the seam primaqiune piping. The lower end of the piping is fixed in the manner shown in figure 508 G.
Processing clasp with obrazcami-podborany. Facing the fold with the products, right sides inside and pritachivajut on the part of the product (Fig. 509). At the end of the zipper to the seam allowance nullify, netscout, not dorezaya to the lines of 0.1, see the Facing folded to the inside details, straightening Kant in the direction or positioning of the piping seam along the fold depending on the model. The inner sections of podborov bend towards the inside of 0.5-0.7 cm and zastrugivajut at a distance of 0.1-0.2 cm from the bent edges or attach hand stitches. Treatment closure two obrazkami with the formation of Kant from obrazek. The inner sections of podborov bend towards the inside of 0.5-0.7 cm and zastrugivajut at a distance of 0.1 cm from the bent edge (Fig.510 a). The outer sections of obcutek bend towards the inside of 1-1,2 cm and iron. On the front side of the primary outline construction lines to the left and right of the median at a distance from it equal to twice the width of the edging (Fig. 510 b). Piping is applied face-up on the front side of the product zautyuzhennoy bends to the auxiliary lines and primetyvajut from the bend at a distance equal to the width of Kant, pritachivajut. Piping bent in opposite directions from the middle, the main part is cut from the inside in between the lines, not reaching the ends of the lines 1-1. 5 cm incision is performed inclined towards the end of the string, not dorezaya 0.1-0.15 cmPiping turn inside out the main parts, put them right sides inside and sew from the end to the bottom of the stitching along the intended bend lines. The ends of obcutek tighten, the core part bent at the end of the fastener, the area at the end of the cut, straightened, bent on the piping and secure the two ends of the clasp double reverse stitching at the base of the area (Fig. 510). The lower sections of obcutek bends and zastrugivajut as well as the internal, and then attached to the main details in a few places with hidden stitches. Machining casting fasteners straps and obrazcami-podborany. For processing such a fastener cut out two strips (Fig. 511 a, b) and two podborta, as both sew-in straps. The strap can be cut with podborta (Fig. 511). 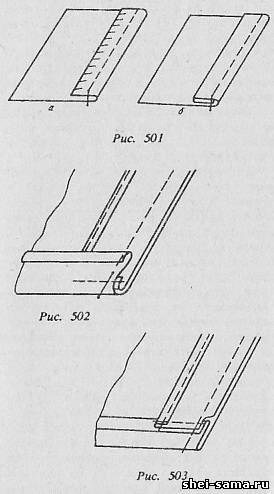 In this case, the bar bend along the crease line, fold in half, right sides inside, and grind the ledge - upper end of the bar from the bend to the notch that defines the middle of the strap. If the top strap is cut separately from podborta, first treated the inner edge of podborta the manner specified above, then the bar impose a face on the front side of podborta, call the upper sections and outer edges, primetyvajut the ledge and the outer edge of the plank, grind. Joint width of 0.5-0.7 see the Seam in the cut area. Bar twist on the front side, the seam and the corners straighten, spawn and priorivet. 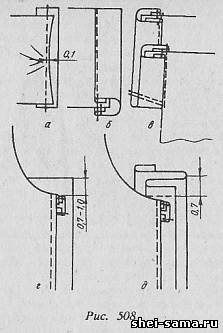 On the bar, plan a line of primaqiune, simultaneously determining the width of the strap.To the underside of the main part of the fastener end of primetyvajut or pritachivajut dolevik. The bar processed is applied to the side of the main part, equating the external sections of the strap with the planned auxiliary lines or equalizing the sections of the strap with the edges of the cut, primetyvajut and pritachivajut side planks to podborta. Allowed primaqiune strap with podborta. Cutting the holes for fasteners and the end treatment performed as well as the handling of the clasp casting straps without podborov. Seams primaqiune strap iron and bent in the direction of the main part and in rare cases rautureau. The inner edge of podborov attached to the front in a few places with hidden stitches. The clasp ready priorivet (Fig, 511 g). Processing of zipper tape-the zipper on the whole front of the bodice. For processing such a fastener cut out one or two of the piping for handling slit front and two piping-podborta. The facing applied to the front side of the front, primetyvajut and grind the cut fasteners from the main part, making the rounded end of the clasp. The distance between the lines can be from 0.3 to 0.8 cm depending on the model and size of the parts of the braid-lightning. The detail between the lines is cut, making the two the notch in the curve. The facing folded to the inside of the front, straighten the seam, forming, edging to the side of the piping with a width of 0.1 cm, priorivet (Fig. 512 a) . The front slit can be treated with two obrazkami with piping from obracac (Fig. 512 b) type loop. Piping-podborta fold, right sides inside, equalizing sections, and sew from the bottom up to the notch defining end of the clasp. Seam width 0.5-0.7 cm, in the case where the clasp is machined without the finishing stitches, in the presence of stitch finishing, joint width should equal the width of the finishing stitches plus 0,5-0,7 cm Seam up to the notch rautureau, and from the notch up iron the edges to the width of the seam.The inner sections of otacek-podborov bend towards the inside of 0.5-0.7 cm, zametyvayut and zastrugivajut at a distance of 0.1-0.2 cm from the bent edge. To press the edges of obcutek inner side primetyvajut and pritachivajut braid-the zipper. When participarii the braid-zipper is applied on the front side piping lock down (Fig. 512, g). Processing a hidden zipper. In this case, on the right shelf is designed stock and the three vertical lines, the first edge of the side products, second and third parallel to the first and located at the side of the cut shelves. Define the middle and width of the allowance for processing fasteners (Fig. 513 a). On the first line on the wrong side shelves bend podbot and overcast loop, placing them in shared direction. Shelf bend at the third line wrong side in and zastrugivajut formed a fold of the seam width 0.5 cm (Fig. 513 b).Shelf swerve to the side, the opposite side, fold it back inside out, blending the edge of the Board and jotted bend. Between the loops lay the lines in the transverse direction (or a paperclip), with a shelf underside up in the opposite fastener side. The clasp priorivet. The left shelf is treated in the usual way. Treatment of the clasp of the skirt. Treatment of fastener on the front panel of the skirt do so. From the inside tissue on the planned line from the side of the allowance for processing fasteners primetyvajut with a little tension and pritachivajut a strip of calico or calico at a distance of 0.2 cm from the seam allowance (Fig. 514 a). Cut clasp grind stripe lining fabric seam width 0.4-0.5 cm, paving the line on the strip (Fig. 514 6). In skirts of cotton cloths, cut the clasps bend towards the inside of 0.7 cm and zastrugivajut paving line at a distance of 0.2 cm from the fold. Bent edge is attached in three places 5-b concealed stitches in each setting. In skirts without belt clasps the edge of the bend along the line of the face inward and grind the seam width 0.7 cm from the edge of the buckle to the notch that defines the beginning of primaqiune grosgrain braid. The angle of the fastener turn, spawn and priorivet. When processing the fasteners on the rear cloth skirts of wool fabric cut seam allowance of the front and rear panels of grind the strip of cloth, then wrap around it a slice and scribble in the seam grinding. The inner edge of the piping bends 1 cm and zastrugivajut at a distance of 0.3 cm from the bent edge. 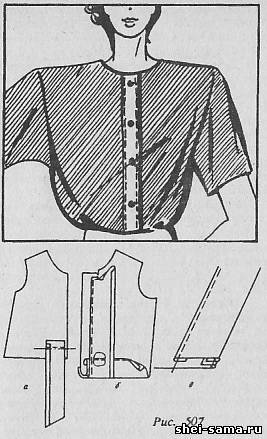 The width of piping must be such that the facing fell under the tack fastener and loop for hooks, and line must not be visible from the front when buttoned skirt. After smachivaniya, grinding and resoluzione slices of skirt end fasteners fasten to the underside on the front panel of the skirt by three transverse lines above the lower end of the clasp to 1 cm. On the front panel from the front side prostrachivajut finishing line on the value of the length of the fastener or the edge of the clasp vspuchivajut manually from the inside. When processing the side seams vrazalic the rear panel of the skirt at the end of the zipper cut at an angle, not reaching 0.2 cm to the lines of the piecing together of the side seam and secure the fasteners (Fig. 514). Split the side seam and zipper overcast. The inner edge of the clasp on the front panel of the skirt is folded and sutured around the seam to the skirt panel is manually hidden stitches. The clasp priorivet from the wrong side through a damp protohellenic. In the front panel of the skirt near the line or spuski are inserted hooks, and the rear panel are made of loops. Similarly processed closure at the side seam in the women's bookah. Processing of zipper braid zipper. When processing the fastener tape zipper (Fig. 515 a) it is located in the seam grinding slices or with a small offset. Processing of zipper tape-zipper located in the seam stitching of slices produced. Cuts or folds smatyvay and grind, before reaching top size fasteners, rautureau. When razoruzhenie seam along the planned lines iron the edge of the fabric left for the clasp. The zipper is applied from the inside to press the edges and primetyvajut. The edges of the braid on a level and press the edges pritachivajut to the front of the line at a distance of 0.5 cm from the edge. On the front side lay the finishing line at the distance prescribed by the model.When processing the zip fasteners in the opposite fold each half placed under the crease of her folds, primetyvajut and pritachivajut to the allowance for the fold is not caught under the stitching. The inner side of the second pritachivajut braid stitching to the seam allowance on the fold. During the processing of folds without finishing stitches zipper pritachivajut on the inner side of the folds at a distance of 0.3 - 0.4 cm from the edge. Slices clasps grind strips of lining fabric. The strips are folded around the slice, and scribble in the seam grinding.The finished clasp priorivet first from the inside and then from the front side through a damp protohellenic. In the processing of closure, off-seam piecing together sections on the front panel of the skirt leaving a seam allowance on the length of your clasp, 2.5-3 cm, on the rear panel,1-1. 5 cm skirt Seams metiaut, statuut and rautureau. When razoruzhenie side seam allowance for the zip front of the skirt iron on the planned line. One side of the braid-lightning primetyvajut to the allowance for processing fasteners of the rear cloth skirts and scribble at a distance of 0.3-0.5 cm from the edge of the braid-zipper (Fig. 515 6). The other side of the braid primetyvajut to the allowance for processing front panels of the skirt so that the edge of the braid-lightning defended from the edge of the buckle on 1-1,5 cm, and scribble at a distance of 0.2-0.4 cm from the edge of the braid on the inside. The inner edge of the braid on the front of the skirt hem to the main part of hand with hidden stitches. The end closure is fixed from the inside on the front panel skirt of two transverse lines. The finished clasp priorivet through wet protohellenic on the reverse and obverse sides.